The salt-water loving trees form interminable marine forests covering 175 square kilometres along the coasts of the mainland and the islands of Siargao and Bucas Grande. People who are interested in game fishing and spearfishing will enjoy its bountiful seas along the tuna route, there are over 23 different species are caught the whole year round. Marlin, tuna, lapu-lapu, mollusks, crabs, even squids, stingrays and octopuses can be bought fresh and cheap from the fish vendors and fishermen. There are many caves and tunnels in its islands. Some are half-submerged in water most of the time and could be accessed only during low tides like the Sohoton Cove at Bucas Grande Island. 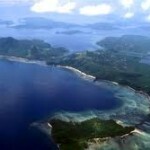 Nonoc Island has one of the world’s largest deposits of nickel. The smaller ones either rest on sand and gravel or have a limestone base bonded by boulders, reefs and sandbars. 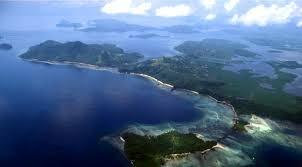 Surigao City, the provincial capital is dubbed as the “Gateway to Mindanao”. The ferry landing terminal in Lipata links Mindanao to Luzon through Eastern Visayas. It annually showcases in full regalia its distinct cultural heritage through the Bonok-Bonok Maradjao Karadjao” Festival. It is a provincial city that offers a respite from the busting metropolitan life. Weaving of baskets and hats is taught in the schools, along with embroidery. Those who live in coastal areas engage in fishing and in catching tortoises, which are sold in the markets. There is considerable trade along the seacoast. The province has many tourist attractions natural as well as man-made. There is the Mother of Perpetual Help on Ceniza Heights built by devotees of this patroness and surrounded by natural green landscapes. There are historical landmarks like the Labor Monument in the capital city, the century-old replica of the Liberty Bell on Capitol Site, and the US Landing Avenue in the town of Loreto. Above all, however, Surigao del Norte is known for its white sandy beaches, mountains, rock formations, caves and lake islets. IPIL Beach resorts, featuring a white pebble beach of clear sea water along lush coconut trees, the Ipil resorts are just 10 km. away from the city proper. is a resort where the white beach is rich in sea shells, and shell aficionados often go there to collect rare shells. 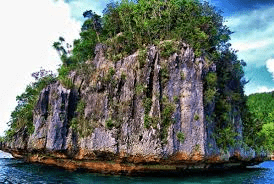 Mabua Beach has rock formations which serve as natural diving boards for swimmers. It is located near a precipice ideal for amateur mountain climbers. Other favorite sports of visitors are PANOMBOYON BEACH, with its fine coral rocks, and GENERAL LUNA beach, frequented by surfers and scuba divers. 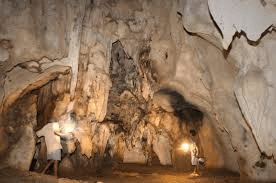 Then there are the caves like Mapawa Cave which has cathedral-shaped inner domes, natural chandeliers and other sculptural forms which impress tourists. 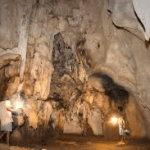 BuenAvista Cave has three entrances which lead to a cavern which stretches for three kilometers. The cave has unique stone formations which create the illusion of a royal court, and a knee-deep underwater pool. Punta Kalebera (Skull Piont) a naturally sculptured stone formation Located in Catadman on Hikdop Island. From a distance the stone looks like a skull of a man, formed as a result of the continuous lashing of the waves. Located in Sibale Island, has unique dagger-shaped structures which rise to a height of 20-feet and occupy an area of about one hectare; the natural sculptures are surrounded by waist-deep, crystal-clear waters. Basul Isalnd, lying northwest of the city, is notable for its beaches with empty shells and corals. From this island, which guards the entrance to Surigao Channel, can be seen the Surigao Strait, site of the 1944 battle between the US and the Japanese. Raza Island, where the tide reverses itself every six hours, one can simultaneously watch the low tide at one end of the island and the high tide at the other end. It is common to see people picking up sea shells at one end and then continuing the task at the other end when the tide reverses. Sta. Monika, has the best known waterfalls in the province with its well-preserved natural environment; and BUYHO, where the waters cascade down 70 feet from a pool-like reservoir. 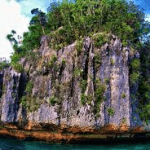 These are among the many attractions which await the adventurous traveler to Surigao del Norte.